There are a bunch of stand-alone tools / utilities, to make your life as a Zazzler much easier. Some are there to help you when you’re browsing in your store’s back end, some for when you’re looking at Zazzle’s reports and stats. 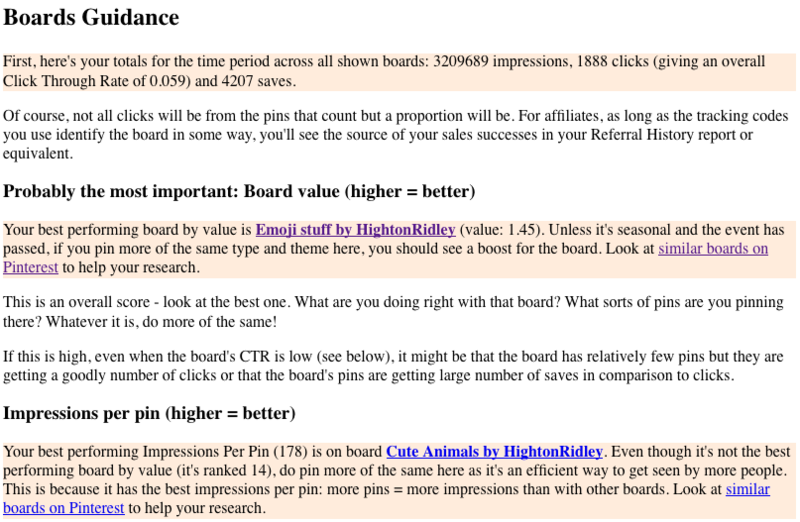 There’s also a stand-alone promotion tool that’s an alternative to the standard nIFTTTy Scheduler and one to help you improve on Pinterest. Note that all data is private to you and can’t be got at by anyone but you. This is a bookmarklet to help you browse your product stats and guide you in where you need to improve or where your successes are, in comparison to others. You can sort what you see in your store’s back end by any of the standard stats that Zazzle gives. You can go high-low or low-high and you can highlight any stat to make it easy for your eye to pick them out on the page. As well as highlighting and totalling, there’s an optional export of the product stats for use in a spreadsheet, if that’s what you want. There’s also a comma-separated list of product ids, for all products shown, that can be used with the nIFTTTy Pid Scheduler. Get the NiftyZSort bookmarklet from our Razamazazzle blog. Later, we’ll move it here. 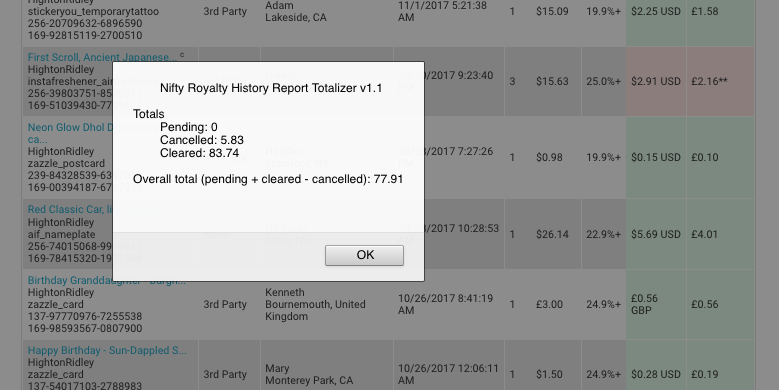 The royalty history page totalizer is a bookmarklet with one job: to add up the figures on whatever page of your royalty history you’re on. Maybe the simplest and most useful utility of all! Get the Nifty RHP Totalizer from our Razamazazzle blog. Later, we’ll move it here. ℹ️ Find out more about bookmarklets on Wikipedia. You’ll maybe want to bookmark these to save you from coming back here for the link each time. 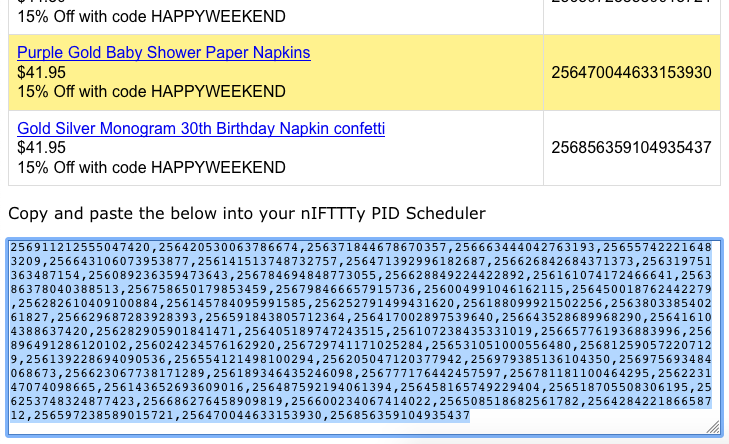 However you get hold of a list of product ids, the nIFTTTy Pid Scheduler will automatically promote them down whatever channel (social media, email, pinterest) you choose, according to a schedule you set. 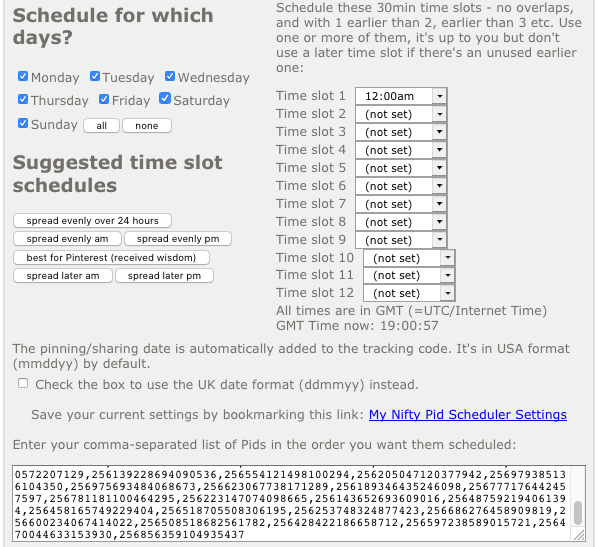 The schedule you make actually works in conjunction with IFTTT, a free, online sharing service. Find out more in the IFTTT Wikipedia entry. If you’ve used the standard nIFTTTy scheduler available via the Nifty Promo Control Panel, the pid scheduler should be second nature to you. As mentioned above, the NiftyZSort bookmarklet can make a list of Pids from the products on display in your store’s back end. If you want to get a list of pids from other people’s stores or from the marketplace, use the NiftyZPids bookmarklet, made just for that purpose. Again, it’s currently on the Razamazazzle blog but we’ll move it here at some point. Update April 25th 2019: Pinterest have revamped their analytics pages and that’s broken the guide. Seeing if it can be fixed is on the to-do list. This helpful tool gives you useful guidence on improving your performance on Pinterest. You copy and paste in your Pinterest profile analytics page (business accounts only) and it analyses it and gives you concrete, personalised actions to take, based on what it finds. You can export the data tables created behind the scenes to keep a history – most people use a spreadsheet to do that. It’s a great way to track progress.